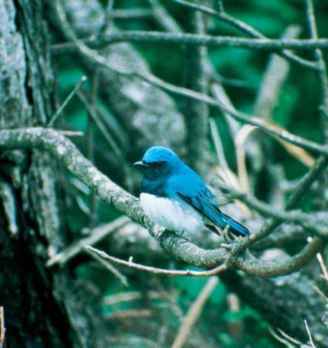 The Old World flycatchers are a large and variable group consisting of about 135 species of songbirds. The subfamily Muscicapinae includes small- to medium-sized birds, with a body length generally ranging from 3-9 in (7.6-23 cm). The bill is relatively small, short, vertically (dorso-ventrally) flattened, and pointed. There are stout, well-developed bristles (known as rictal bristles) at the gape of the beak, which help increase the effectiveness at catching flying insects. The legs are relatively short and the feet small but well suited to perching. Coloration is highly variable among species, ranging from dull gray or brown to bright blue or vermilion and sometimes occurring in stark patterns. The sexes are colored alike in many species, but are dimorphic in others. Young birds are usually relatively subdued in coloration and spotted on the back and/or breast. is short and the legs and feet are variable in length and stoutness. An area of bare skin around the eye is variable in color among species. The sexes are colored differently, with the females being generally more subdued in pattern and hue. The plumage coloration of the male is mostly glossy black and white, while the female is usually more brown and sometimes light rufous on the belly. In both the Muscicapinae and Platysteirinae, relatively widespread species have been divided into various gepgraphically distinct subspecies and races that are distinct in elements of their size, plumage, behavior, and song.